*product was received to facilitate a feature. All opinions are my own. Halloween is about a week away now and I’m sure we are all prepping like crazy to get costumes together, pumpkins carved, and treats ready to be passed out for the big day. I have had too much going on this year, and just yesterday finally figured out some of the costumes for my kids. My kids have gotten older and have used their imagination big time for their costumes, which I am excited to see come to fruition. This year, too, they want to have a little more independence when it comes to trick or treating. That can make parents a little bit crazy, you know? It’s hard to go from always being next to them as they go throughout neighborhoods to not being there at all because your kids have grown up. It can be frightening to let them go on their own. To make the transition easy, there is a cool new app available called Flares. If your kids have a phone, they can download the app. As they go about trick-or-treating, they can simply push a button to send a flare to you. This sends a message to you giving you their coordinates, so you know exactly where they are. After you see the message, it disappears after 40 seconds. As they trek the neighborhood on Halloween, they can easily send a few flares your way and, although you aren’t right next to them, you will know exactly where they are and where they have been! So much easier than texting for them when they are on the go, it will give you peace of mind and give them the feeling of independence. Now that the kids are out the door, you are free to hand out some treats to those ghoulish visitors that will be coming to your door. If you candy scares you, have no fear, there are healthy alternatives available! 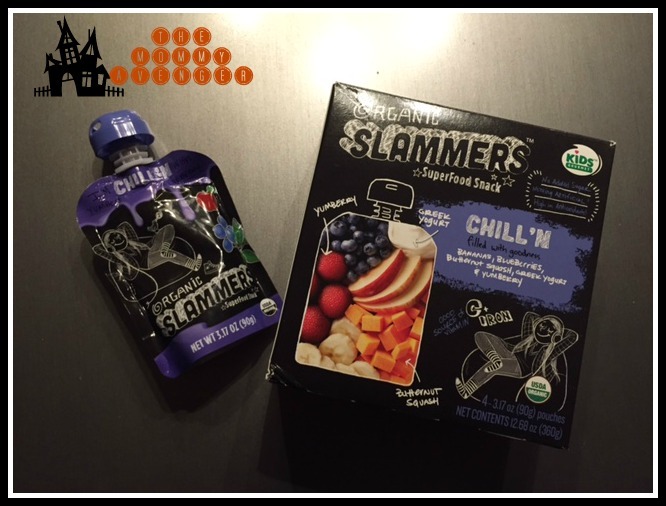 Check out these portable pouches of goodness, Slammers Snacks. We received some to check out and my kids love the organic fruit pouches. A delicious blend of fruits and veggies (your kids will never know!) and other healthy ingredients, packaged in a fun and bold way to appeal to little ones. I love these to put in school lunches, but they make a great choice for handing out for Halloween, too! You can purchase them at Safeway and Target.